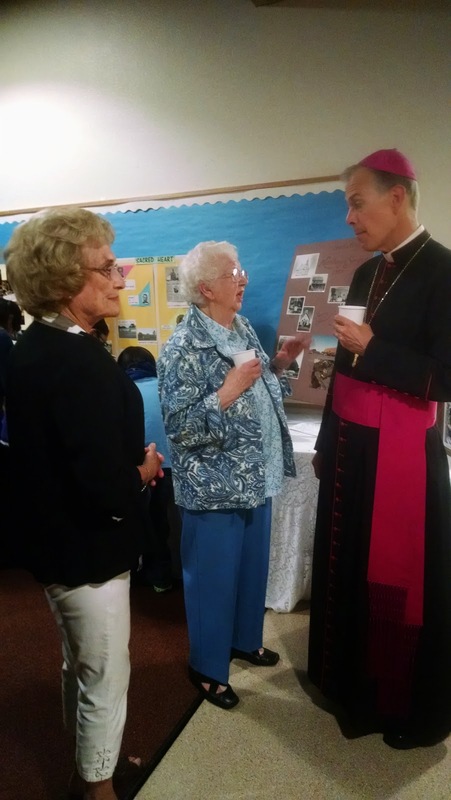 It’s not every day the archbishop visits our small-town church in Newport on the Oregon Coast. In honor of Sacred Heart Church’s 125th anniversary, we welcomed Archbishop Alexander Sample, head of the Catholic church in Western Oregon, for a special Mass and reception on Friday night. It was the first visit by this archbishop, who took office in January 2013. It was a big deal. Our songs and programs had to be approved by the archdiocese. The Archbishop needed three altar servers, one to serve, one to hold his staff, and one to hold the tall gold hat, the mitre, that he wore during Mass over his magenta beanie, I mean zucchetto. We had three lectors. The Knights of Columbus paraded in their regalia, and we combined the choirs from all the Masses for the occasion. 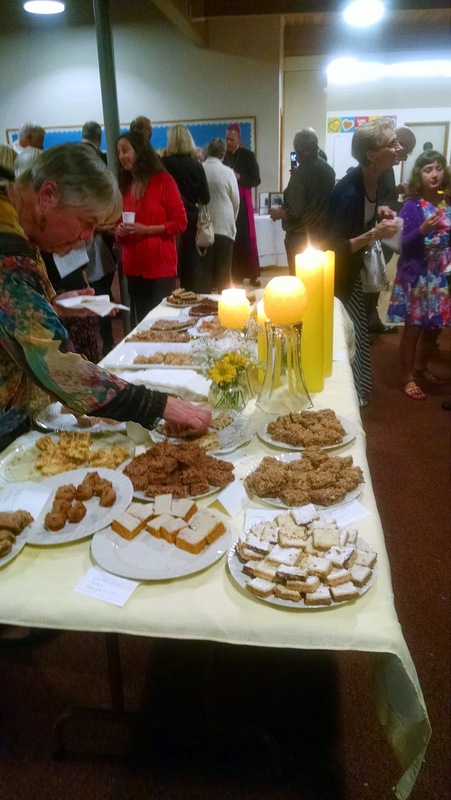 The church was packed, the yellow and white flowers and candles were glorious, and the music we had been practicing for weeks sounded good. Archbishop Sample has a glorious tenor singing voice, and he sang most of the prayers. In his homily, he preached about the past and future of the church and our role as followers of St. Peter. After Mass, we gathered in the hall, where it was so crowded and noisy my throat still hurts from shouting to be heard. And the cookies, oh Lord, for a cookie monster like me, it was heaven. But the archbishop did not indulge. Instead he stood for over an hour as people lined up to meet him. He blessed the sick, listened to the stories of the old, young and in-between, and kidded the kids. 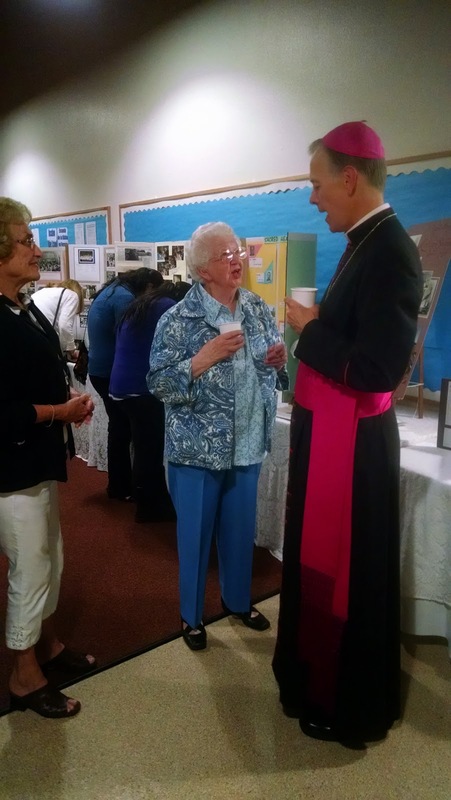 In the picture above, he is talking to Rose Troxel, the church historian responsible for most of the photos and memorabilia on display behind them. Meanwhile, we all fell in love with the tall, handsome archbishop. Sunday it was back to church as usual. I hope the archbishop got a chance to walk on the beach between events. He did take a few cookies back to his hotel room. He was due in Lincoln City for another Mass on Saturday. Meanwhile, my father is pretty impressed that I sang a solo for the archbishop and shook his hand, and I know the leftover cookies are hidden away somewhere.